What is connecting device? Describe 4 connecting devices. Devices that are used to connect other devices are called connecting devices. That is, connecting device is a device that connects. It operates only in the physical layer. It connects two segments of the same LAN. It forwards every bits it receives. It regenerate bits, does not amplify them. A hub is a multi-port repeater. That is a hub can connect more than two segments of a LAN where a repeater can connect only two segments. It also does not have any filtering capabilities like repeater. 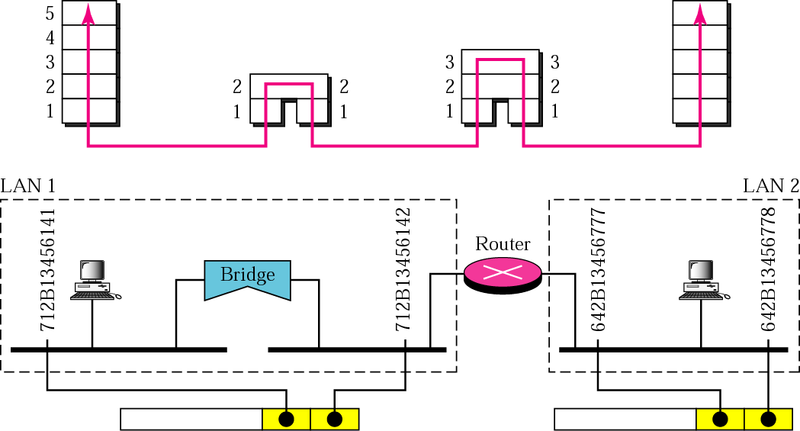 A bridge operates in both physical layer and data link layer. As a physical layer device, it can regenerate bits and as a data link layer device it can check the physical addresses contained in the frame. Bits can be carried to any distance by using properly spaced repeaters but the collision domain will not allow this and that’s why brides are required. Bridge has filtering capability. It has table that maps addresses to port. A bridge can check the table to decide if a frame has to be forwarded or dropped. Bridges also work in a single LAN. 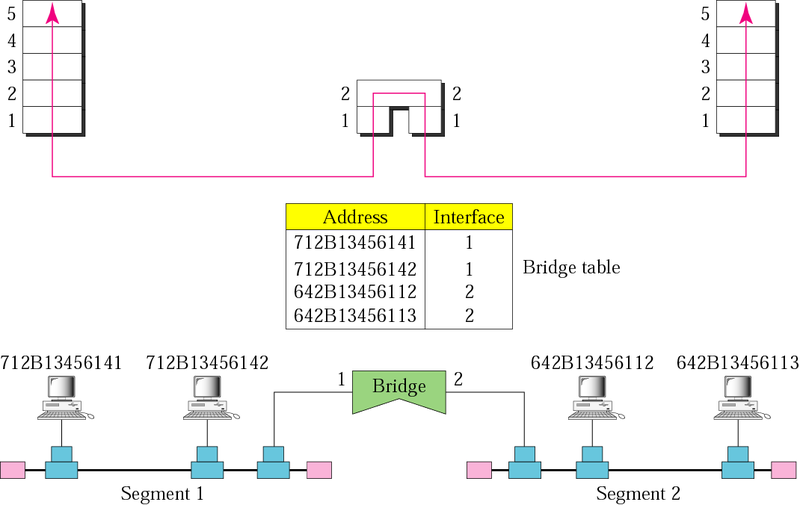 There are some bridges called transparent bridge which can generate its address table automatically by learning the frame movement in the network. A router is three layer device; physical, data link and network layer. As a physical layer device it can regenerates bit, as data link layer device the router can check the physical addresses contained in a packet and as a network layer device it can check the network layer addresses (addresses in IP layer). Routers are inter-networking devices as it can connects LAN-LAN, LAN-WAN, WAN-WAN. Routers can change the physical addresses of a packet. For example, considering a packet is getting sent from LAN 1 to LAN 2 as in the above given figure. At this moment the source address is of the sender’s address and the destination address is of a host of the LAN 2. Now when the packet reaches the router, the router changes the source address of the packet to its own address and then send the packet to the destination address.